Modern unique bath rug. What an inexpensive way to transform your bathroom. Pile height 20mm / .79in rug. High quality, densely woven, very soft medium pile. 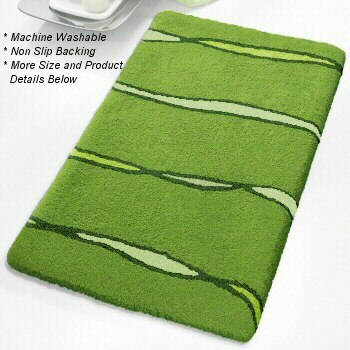 Kiwi Green : Bright kiwi green modern bath rug design. The colors include grassy bright green with dark green lines and yellow green and light muted green in small areas of the rug. Coordinated lid cover is a solid kiwi green. Sunshine : There is no doubt this color will brighten up your bathroom. The main color is a bright red orange tone / sunshine yellow with burnt orange lines. The smaller areas of color include a light yellow and bright orange. Coordinated lid cover is a solid sunshine yellow. Platinum Grey: Gorgeous, fun and unique gray bathroom rug. The range of colors include platinum grey as the main color with dark anthracite grey lines. The other small areas of color include light silver grey and a medium tone grey. Coordinated lid cover is a solid platinum grey. Elongated lid cover for this bath rug design is a solid color.